Acting Colour Sergeant Raj is a consistently outstanding ambassador for the Regiment. He has been an Instructor at Cambridge UOTC, a Recce Platoon Sergeant and Instructor at the Royal Military Academy Sandhurst (RMAS) during the period covered by this citation. 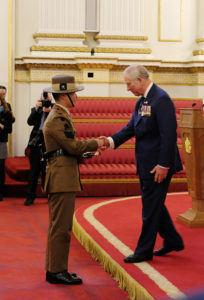 Here is a man who routinely seeks to push himself out of his comfort zone in the Brigade of Gurkhas, seeks opportunity and demonstrates at every juncture his wider employability. He epitomises all aspects of the 16X ethos; proven on operations with the upmost humility. This man cannot be more highly commended- recognition would be well placed- he has much to offer in the Brigade of Gurkhas and will undoubtedly attract the very highest calibre Young Officers in his new post at RMAS. He is first and foremost an outstanding soldier, who uses his operational experience and achievements on courses to great effect when training and leading our men. It is this soldiering and leadership talent that has allowed him to pass the RMAS CSgt instructor cadre as a relatively junior Sergeant. He has already begun to cascade his knowledge to RMAS instructors via a train the trainer package. In support of this, he has recently completed an array of courses to allow him to add value, including Public Order, CIED, CBRN and Drill instructor. As an instructor at Cambridge UOTC, he immediately adapted his style to the challenge of teaching potential officers, and was regarded by the Officer Commanding, Maj Barrington-Barnes as ‘the best Gurkha soldier he had worked with in 25 years’. In his personal time, he develops himself and gives back to others. He volunteers for 2 weeks each year at a meditation camp for novices; effectively doing fatigues voluntarily so that others can engage spiritually. He develops his personal interests with a level of drive that reflects his character; whether powerboating, motorcycling or pursuing a Deer Stalking Certificate. This demonstrably inspires others in the unit to actively seek opportunities in their own lives. He is widely respected, and has a strength of character which underpins his success and approachability. Through relentless self-development and seeking opportunities, he excels both within the RGR and in the wider Army. 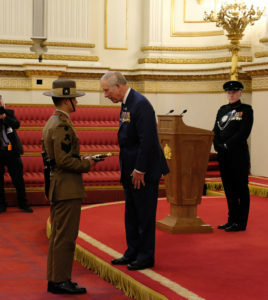 CSgt Raj has continued to embrace new challenges and further the name of the Brigade of Gurkhas amongst external organisations and the wider army and it is for these reasons that CSgt Raj is highly deserving of the Prince of Wales’ Kukri.